The musician was presented with the prize by his friend, singer Rod Stewart, who described him as "the second-best rock singer ever". Sir Elton said he was "flattered" by the award, given to artists who have had a "lasting impact" on UK culture. He also played several of his hits, including Your Song and Tiny Dancer. Students from the Royal Academy of Music, where Sir Elton trained, joined him on stage to play Home Again, from his new album Diving Board, while Stewart duetted with his "dear mate" on the closing song, Sad Songs (Say So Much). The concert was attended by the likes of Liz Hurley and Gary Barlow, while video messages were played from President Clinton, Ringo Starr and tennis legend Billie Jean King, for whom Sir Elton wrote Philadelphia Freedom. The star, wearing red sequinned shoes, received a standing ovation as he accepted the gold Brits trophy. Holding it aloft, he remarked: "They've even made it sparkly on the bottom, which you know I love". He dedicated the award to writing partner Bernie Taupin, "who I wouldn't be here without", as well as the "Women's Institute and you, the fans". I'm addicted to playing live. I've played 92 countries, and I want to play 100. The 66-year-old added: "I can think of a couple of people who might have deserved it more than me." Pop star Lulu, who was a special guest at the show, told the BBC "he is a one-off, he is totally unique. "Only the Rolling Stones, the Beatles and Elvis are at the top [with him]. So it's perfectly fitting he should get the first Icon award." James Blunt, who is signed to the star's management company, described him as "the kindest man I've ever met". "On a music level, on a friendship level, on a humanitarian level this is an incredibly special person - and that's not including his other great talent, which is he is an incredible songwriter and a formidable performer." Sir Elton, who plays more than 100 gigs every year, had to cancel several concerts over the summer after having surgery for appendicitis. He told The Sun he had performed 10 shows "in agony" before he called doctors. "I was a ticking time bomb. I guess I could have died at any time. I feel so lucky and grateful to be alive," he said. Speaking to Dermot O'Leary on stage during Monday's show at the Palladium, he added: "It's been a hell of a summer. I'm glad to be rid of the appendix - it was a pesky little bugger." He said he would not curtail his touring schedule as he was "addicted to playing live". "I've played 92 countries, and I want to play 100," he continued. "That's just the way I'm programmed". The two-and-a-half-hour concert took the form of a career retrospective, with O'Leary interviewing Sir Elton about his career in between songs. He discussed growing up in the "secretive" 1950s and how he had been forced to abandon any hope of becoming a classical pianist because his "hands are too small". The star cringed as footage from his infamously bad-tempered fly on the wall documentary Tantrums and Tiaras was played into the theatre, but he was keen to stress he had put his "little demons" to rest. "I'm not a diva any more," he said. "I like things a certain way but it's called professionalism, I think." He proved his point later by making his band re-start the song Mexican Vacation four times. "It's a new song," he explained, "we're getting excited." 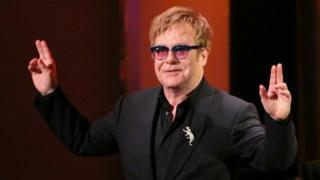 Sir Elton has sold more than 250 million records globally, and next month's Diving Board will be his 30th studio album. His track Candle in the Wind '97, which was released in the wake of the death of Diana, Princess of Wales and which he performed at her funeral, is the biggest-selling single of all time, shifting 33 million copies, 4.9 million of which were bought in the UK. The Icon prize has been created by the BPI, the music industry's trade body, which also runs the Brit Awards. Prior to Monday's show, Sir Elton had already won two Brits for outstanding contribution to the music industry, as well as the Freddie Mercury memorial award for his charity work. He was presented with the latter prize at the White House in 2008, by then-Prime Minister Tony Blair. Proceeds from the Icon award show will go to the Brit Trust, Text Santa and the Royal Academy of Music. The highlights will be shown on ITV on 13 September.